I must admit that it has been quite a while since I've had the time to card any of my own hand dyed wool fiber. 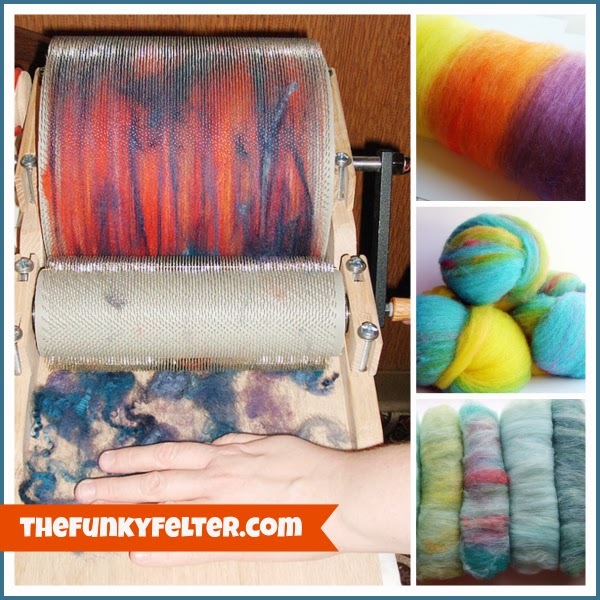 I have a good sized bin full of brightly colored fiber that I dyed a few years ago now and haven't put it through my drum carder yet. I'm hoping to find time in the next few weeks before Christmas to play around with it and make some batts for felting or hand spinning. I'm a bit of a color junky and love to mix colors together to see what pretty (or sometimes not so pretty) wool batts I can come up with. My two Fancy Kitty drum carders are such good little handmade machines and have held up through being hauled around moving from house to house. During all the shuffling, I've kept them handy but unfortunately haven't had much time to use them. I'm really looking forward to carding in the near future and will share my results on the blog eventually. Do you process, dye and/or card your own wool for felting or spinning? It is quite a job to do it from beginning to final product, but I've personally found that when I do take the time and make the effort, it is quite satisfying and adds something special to a handmade item.